Alex Roddie describes his experiences walking Scotland’s greatest long-distance route… with nae boots. This article was first published in The Great Outdoors Magazine, October 2015. Another backpacker had said those words to me at Corryhully bothy back in Glenfinnan, but I’d laughed them off. How bad could Knoydart be, really? Three days into my attempt at hiking the 241-mile Cape Wrath Trail from Fort William to Cape Wrath, I was finding out the hard way. It was my first visit to Knoydart, I’d never walked this far in lightweight trail shoes before, and the CWT was the most serious backpacking route I’d ever done. It was a whole bunch of firsts for me. Despite all my careful preparation, the reality didn’t sink in until I’d been walking for a week or more. The scale of the challenge, and the majesty of the landscape through which I wandered, took time to imprint itself upon me. Trail life has a different pace and a different meaning. But first I had to get through Knoydart. After a day of bogs and rivers in spate, torrential showers and sudden bursts of sunshine, I camped beside a lochan at the head of Glen Dessary. I’d been looking for somewhere to camp for hours, but every inch of ground was too rough, steep, heathery, or saturated with water to support my tent. Finally a reprieve – finally a flat patch of ground with a good view, and the weather even turned dry and bright for a couple of hours while I rehydrated my dinner and looked out over the sparkling waters. Silence enveloped me. I hadn’t seen another person since Glenfinnan. The mountains all around thrilled me with their ruggedness – as stark as the Cuillin, as intricate as Glen Coe, as wild as the Cairngorms. I could feel the clearer reality of the trail nudging at me, waiting for me to welcome it in. Yes, I thought to myself as I washed the silt out of my shoes. This is why I’m here. But I woke only a couple of hours later to violence and chaos. The first gust ripped three pegs out of the turf and turned my shelter into a thrashing mess of silnylon. The wind sounded like a fighter jet tearing overhead and I could feel the force of it trying to peel me from the side of the mountain and hurl me into the lochan. Instant panic, instant action – I was out into the darkness and the freezing rain, desperately trying to find the tent pegs and secure my shelter against this brutal attack. Afterwards, lying shivering in my wet sleeping bag and trying to disperse the adrenaline that surged through my body, I felt as if I’d survived a car crash. And every massive gust that growled and gathered strength on the other side of the bealach made me sit up, shaking with apprehension, and brace the flimsy structure that protected me against the elements outside. 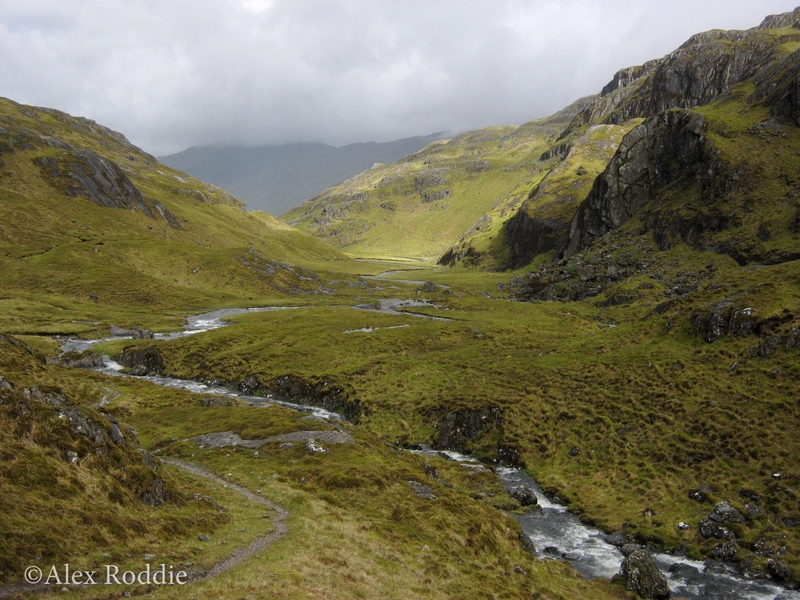 Much further down the trail, I wondered if Knoydart was the reason that so many hikers dropped out that month. The estate manager at Glenfinnan mentioned that he’d spoken to about fifteen CWT hikers a week, but every bothy book on the journey north showed fewer and fewer entries from those on the trail, and the register at the very end contained only a handful of records for the month of June. After Knoydart, I had a pretty good idea of the challenge I’d taken on. Those first 56 miles to Kinloch Hourn were some of the roughest, slowest miles I’d walked in my life. I’d waded rivers, been soaked to the bone as I fought across bealachs lashed by cold winds and driving rain, and learned to cope with having wet feet for days. But despite all that, I knew that one of the hardest sections of the trail was behind me. It was encouraging but also humbling. The CWT was bigger and better than I’d thought. The weather was kind to me for a while after Kinloch Hourn. Sunny skies made me feel invincible. Sadly Knoydart had been too wreathed in mist and cloud for me to see very much, but as I crossed the high pass beneath the Forcan Ridge and entered a new mountain landscape the views opened up and let me drink them in. I stopped worrying about my wet feet, stopped wondering what would happen if I got caught out in a storm again. Freed from those worries, I started to notice details I hadn’t noticed before: the different kinds of mosses and flowers that grew in the cracks between boulders, the way the landscape changed when I followed a watercourse from river to spring, the sculpted wavecrests of the Munros above the clouds. I found the rhythm of life on foot, cranking out a few longer days while the weather lasted, and the trail gave back what I put in. When I craved solitude, I found it in abundance. When I wanted to sit on a rock and watch the pattern of cloud shadows on the moorland for an hour, I had the freedom to do so. 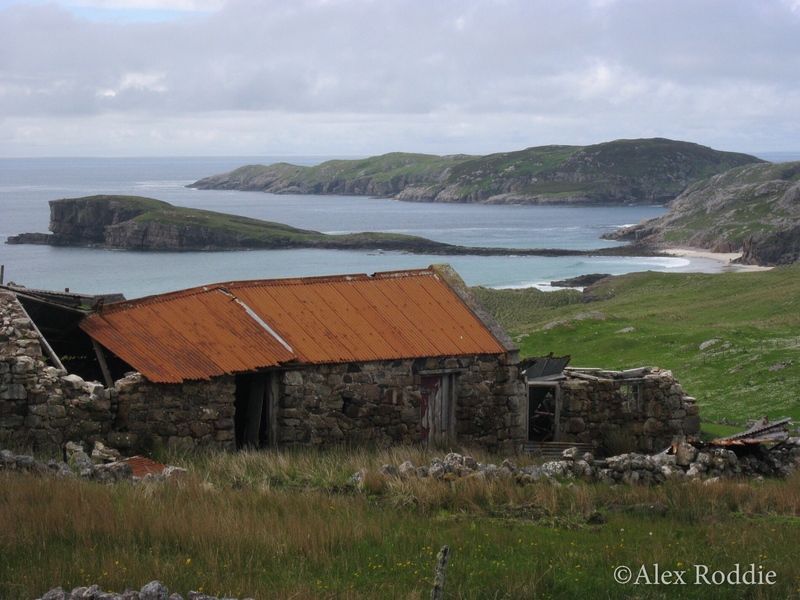 And when I wanted to be around other people, the option presented itself – usually in the form of bothies, which I stayed in almost as often as I camped. At the remote bothy of Maol-bhuidhe I was met by my friend John Burns who hauled in a feast of bolognese, olive bread, pate, and a box of wine. We shared these treasures with two other backpackers in that lonely haven and I felt rich beyond imagining. I heeded his advice. In 2012 my rucksack had weighed 16kg. By 2014 I’d reduced that to 12kg for summer trips. In 2015 I wanted to get my base weight – that is, the total weight minus consumables like food and fuel – below 9kg, and I wanted to fully commit to lightweight trail-running shoes. I’ve spoken to people who believe that lightweight gear has no place on a tough route like the CWT. My experience with high winds in Knoydart had been a bit of an eye opener, but at the same time I have no doubt that carrying extra weight would have seriously reduced my chances of actually completing the route at all. I met quite a few backpackers with massive rucksacks at the start of the trail, but none whatsoever after about a hundred miles. With hindsight, I could easily have cut another kilo from my pack weight. Would it have made the trail any more enjoyable? Maybe not: the miles would have weighed less heavily on my shoulders, but sometimes a small luxury at the end of a long day can be worth more than any number of kilos subtracted from your gear spreadsheet. I certainly felt envious of the guys carrying comfy sleeping mats, extra warm socks and fresh coffee! When choosing my equipment, I aimed to tread a fine line between picking gear as light as possible and packing a little comfort and security with me. Sleeping bag: Rab Neutrino 400 down bag, rated to 2 degrees C. A good choice for the cool prevailing conditions. Tent: Tarptent Notch. This is a lightweight US-made shelter weighing 855g including the full inner. A shelter capable of performing in high winds is essential for this trail, although I ended up staying in bothies whenever I could. Stove setup: I took an Alpkit Koro titanium gas stove with a home-made pot cosy, which helped boost fuel efficiency. With hindsight I would have opted for a much lighter alcohol burner like the Caldera Cone. Meths fuel was abundant at every resupply point. Rucksack: ÜLA Circuit 68 litres. Another lightweight American product. This rucksack performed superbly. Footwear: Inov-8 Roclite 295 ultralight trail-running shoes. These performed extremely well in every aspect but durability. Sadly they started falling to bits about 150 miles in, necessitating the purchase of new footwear at Ullapool. Clothing: I took two baselayers, thin trekking trousers, a 100-weight fleece, waterproofs, two spare pairs of hiking socks, and Sealskinz waterproof socks (which leaked, but kept my feet warm on the really wet days). Navigation: Harvey’s new waterproof Cape Wrath Trail 1:40,000 maps were superb. I also loaded the Cicerone guidebook for the trail on my phone’s Kindle app. Unlike on popular trails like the West Highland Way, a compass is absolutely essential – as is the ability to perform navigational techniques such as contouring and aiming off. Kinlochewe to Shenavall bothy, taking me over the halfway point, was a long, tough stage. Bad weather had rolled in again and I found myself up to my knees in a bog, surrounded by mist, miles from the nearest path and even further from a road or a dwelling. The question why am I doing this? crossed my mind after I realised I’d been walking the wrong way for a while and probably should have taken a bearing. It was one of many sections that will punish the inexperienced or the unprepared. 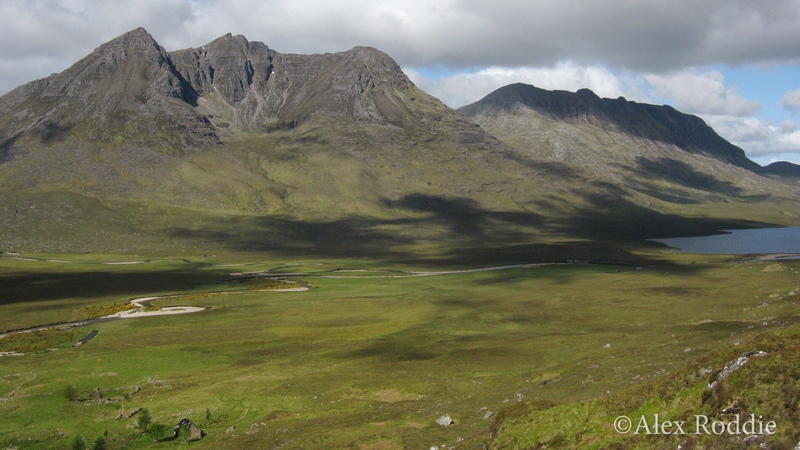 By the time I reached Shenavall, the legendary bothy at the foot of An Teallach, I was done in and morale had taken a hit. Low cloud had once again hidden my views of the wonderful mountains I’d been looking forward to seeing. But, when I reached Shenavall, the unique camaraderie of the British hills lifted my spirits: fire, food, whisky and stories, all shared equally by the bothy residents. Amongst the interesting people I met that night were Martha, a section hiker aiming to reach Cape Wrath from Achnasheen; four experienced hillwalkers down from doing the Fisherfield Six; a newly married couple on their honeymoon; and, the next morning, an American walker called Jamie who gave me my trail name: Naeboots. Trail names are commonly used in the USA but are unusual this side of the Atlantic. Jamie and I were talking to a Scottish walker, who mentioned to the American that I’d walked over a hundred miles ‘wi’ nae boots, just flimsy trainers’. Jamie suggested that I adopt this as my trail name, and from that moment I signed my name off in every bothy book as ‘Alex Naeboots Roddie’. The sunshine returned the next morning, and I left the bothy glowing with appreciation for the spirit of human friendliness that Shenavall had shown me. Once again, when I was in need, the trail provided. I didn’t really want to reach the end of the trail, but all good things come to an end. I had certain expectations when it came to camping at Sandwood Bay: a perfect grassy pitch in the dunes, maybe a stroll along the tideline before watching the sun set over the ocean and going to sleep under the stars. In reality, it rained for fifteen hours and I never left my tent. The last day was a short one but very much in character with the rest of the CWT: a river crossing, followed by several rough, pathless and boggy miles, all enjoyed in the teeth of a bracing northerly wind and regular downpours. Much of Cape Wrath is actually a live firing zone for the MoD but I hadn’t been able to call range control for an access update. When I reached the barbed wire fence, I couldn’t see any red flags – visibility was terrible – so I assumed everything would be fine. I hopped over the fence and kept walking. When I finally reached the access road for the lighthouse, less than a mile from the end of the trail, a sentry cheerfully informed me that the RAF would commence bombardment in fifteen minutes, and that I would have to take shelter in the lighthouse until the all-clear was sounded. As I approached the peninsula, the Atlantic surrounded me on three sides, thundering against high cliffs and filling the air with spray. The desolate moorland here was intensively used by the MoD – I’d found empty bullet casings to prove that point – and yet it felt as wild as the most remote mountain landscapes I’d crossed on my journey. Wildness may be an intrinsic quality but it’s also a state of mind. Maybe that’s what the Cape Wrath Trail is all about. The lighthouse at the farthest north-west point of mainland Britain didn’t quite seem real to me when I reached it. What did it mean for the trail to be over? How could I have walked so far already? Would would happen now? I sat in the little cafe and drank tea with a man who was cycling around the UK. We spoke for nearly an hour and swapped stories of our adventures: mine all about bogs and unreasonable amounts of water, his about punctures and more miles per day than I could fathom. As we spoke, it suddenly hit me. The trail doesn’t end there; it never did. It was only ever meant to be the beginning. The Cape Wrath Trail is the best, toughest, wildest, and most moving thing I have ever done. Thinking of hiking it? It’s worth every mile – but you’ll only succeed if you embrace the lows as well as the highs. And take a spare pare of socks! My CWT route is based on the main route laid out in the Iain Harper Cicerone guide to the Cape Wrath Trail, but numerous alternative routes exist. For this reason no two CWT thru-hikes are likely to be exactly the same. 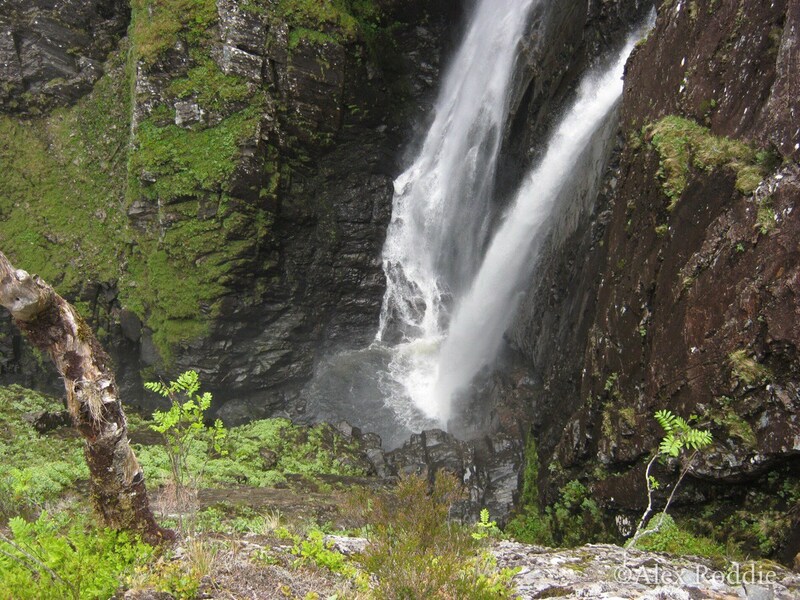 Fort William to Cona Glen, 11 miles. 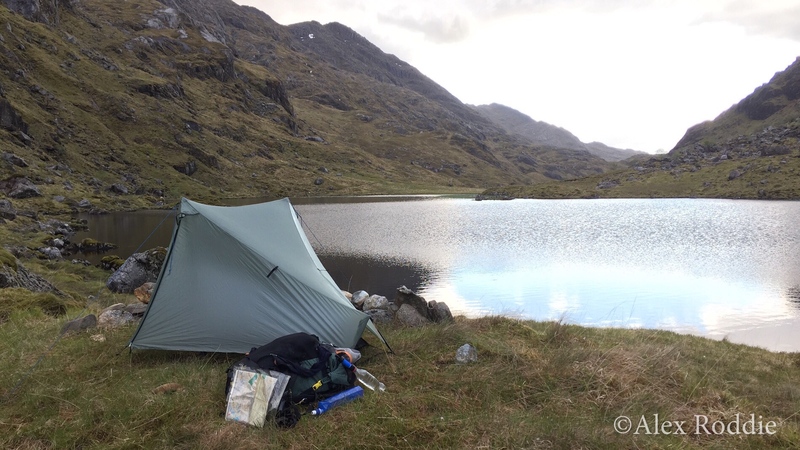 An easy walk to start the trail, ending at a wild camp. 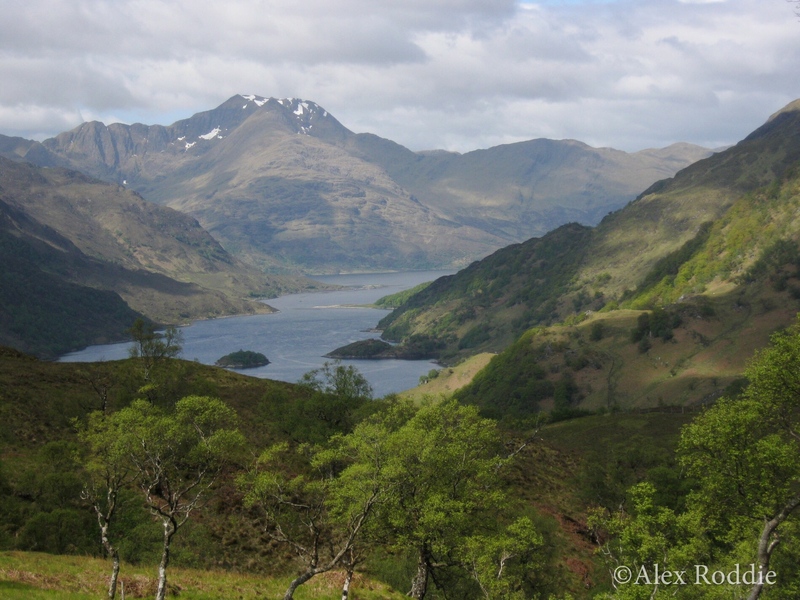 It’s temping to push on to Glenfinnan but pacing yourself at the start isn’t a bad idea. Cona Glen to Corryhully bothy, 12 miles. Poor weather made stopping at this bothy an easy choice. Corryhully bothy to Lochan a’Mhaim, 11 miles. Many hikers will choose to stop at A’Chuil bothy or Sourlies bothy instead of wild camping in between. Lochan a’Mhaim to Barisdale bothy, 11 miles. Harder than it looks on the map. In good conditions pressing on to Kinloch Hourn will make sense. Barisdale to Kinloch Hourn, 7 miles. A beautiful walk along the edge of a sea loch. Kinloch Hourn is the last good place to stop overnight before Shiel Bridge. Kinloch Hourn to Shiel Bridge, 9 miles. The high route beneath the Forcan Ridge is spectacular. Rest day at Shiel Bridge. Amenities here include a campsite, hotel, shop, and bunkhouse. Shiel Bridge to Maol-bhuidhe bothy, 17 miles. 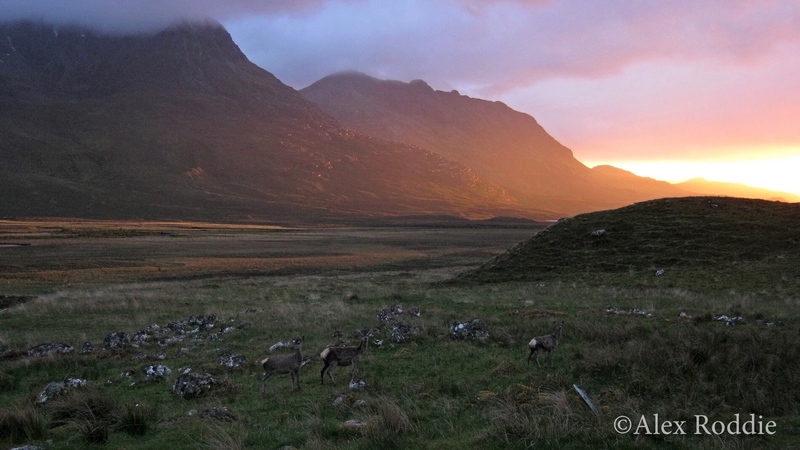 This leg takes you into magnificent wild country, and Maol-bhuidhe is an excellent bothy. Maol-bhuidhe bothy to Coire Fionnaraich bothy, 16 miles. Plenty of rough and pathless terrain here, but Strathcarron provides a worthwhile pitstop on the way to Torridon. Coire Fionnaraich bothy to Kinlochewe, 17 miles. One of the best days on the trail, weaving a hard route round the back of Beinn Eighe. Kinlochewe to Shenavall bothy, 18 miles. In bad weather this can be another tough stage, but it passes through some of the best wild land in the UK. Shenavall bothy to Ullapool, 18 miles. The lengthy diversion to Ullapool, including a stretch of main road, is only recommended if you need to resupply. A wilder option takes a more direct route north. Rest day at Ullapool. A good place to buy supplies and repair or replace gear. Ullapool to the Schoolhouse bothy, 16 miles. An easy stage along good paths. The Schoolhouse bothy to Glen Oykel, 14 miles. You will walk through forestry plantations for much of this section, but views of Assynt ahead will draw you onwards. Glen Oykel to Inchnadamph, 10 miles. Bad weather will again make this stage harder than it seems on the map. Inchnadamph to Glendhu bothy, 12 miles. One of the roughest but most magnificent days on the trail. Glendhu bothy to Rhiconich, 18 miles. I walked along roads for much of this day due to a minor injury. A better route takes rough and pathless terrain beneath Foinaven. Rhiconich to Sandwood Bay, 12 miles. An easy day offering the chance to stock up on supplies at Kinlochvervie before the final stage. Sandwood Bay is a great place for a wild camp but some hikers may choose to press on to Cape Wrath. Alexroddie.com relies on support from readers like you. Please consider making a small donation on PayPal. Thank you!